It all began in the first half of the 17th century in the Black Forest in Germany when the first Black Forest Clock had been made. Today the cuckoo clock is the mother of all German clocks. This cuckoo clock is made by the Anton Schneider clockmaking company in Schonach. Schonach is the heart of the cuckoo clock production in the Black Forest. Most of the famous Black Forest cuckoo clock manufacturers have their workshops in the small town of Schonach. Of all the Anton Schneider clocks this large premium cuckoo clock is one of the most fascinating and definitely one of the best equipped Chalets cuckoo clocks that the Black Forest has to offer. Besides a comfortable 8-day movement (Regula clockwork - made in Schonach Germany by SBS Feintechnik) that only needs winding up once a week, this cuckoo clock has a high quality Swiss musical mechanism made by Reuge that alternately plays two German folksongs (“Edelweiss” and “Der Fröhliche Wanderer – Happy Wanderer”). The music is played with 36 tones. Our product description above offers a link where you can listen to the music of this cuckoo clock. The clock has the typical weights of every cuckoo clock that look like fir cones. Two of the three weights drive the clockwork and the third one is for the musical mechanism. For winding up the clockwork the ring ends are pulled down. The cuckoo opens the door every half and full hour and makes his typical coo-coo sound that is generated mechanically by two bellows. After the cuckoo sound every full hour the music starts to play and the moving elements of this clock start to act. Among them are the wonderful handmade dancing figurines that are situated below the cuckoo door. The dancing figurines are handmade and handpainted. Our zoom-picture of the dancing figurines give a good impression of how detailed the dancing figurines have been crafted. But there is much more to explore on this cuckoo clock. While the music plays there are other actions taking place. The wood chopper chops his axe, the sawmill moves and then the bell in the tower will ring. All movements are also generated from the mechanical mechanism within the cuckoo clock. The moving elements of a Chalet cuckoo clock are what make them interesting for many years to all members of the family. Another excellent feature of this cuckoo clock is the automatic night shut off. All sounds can be turned off completely or alternatively shut off only from 8 PM to 8 AM. The automatic night shut off is a very popular and comfortable feature on Anton Schneider cuckoo clocks. Furthermore this cuckoo clock has all the Anton Schneider Clocks Premium Line characteristics like wooden hands, a wooden dial and a wooden cuckoo. Although our zoom-pictures a very detailed and you see a great number of details on them, you will find out that this cuckoo clock is even better once you have it at home. The size of the clock, the endless details and the quality of the craftsmanship will simply fascinate you once you get the 3D perspective of this cuckoo clock hanging on you wall. Every time you walk around your cuckoo clock you will find something new you haven’t seen before. The little window on the side, the little fountain or the little flowers that sit in front of the sawmill are some of the features that wait to be discovered. 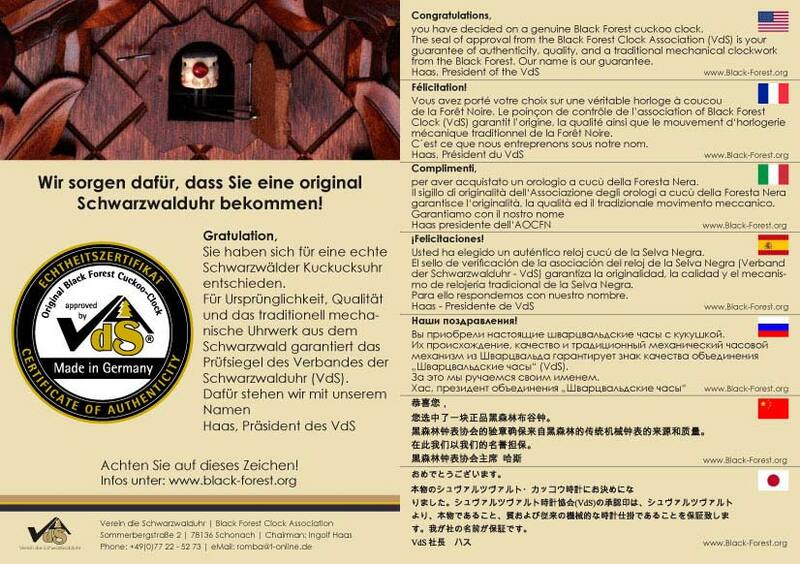 And above all, because cuckoo clocks are handmade there will be no 100% identical clock in the world. This makes every cuckoo clock unique.